Navigating social interactions with autism. Play dates are beneficial for all children. They enable kids to practice critical social skills on which future relationships will be built. The benefits of play dates include: increasing confidence, improving social decision making, and practicing skills in an adult-supervised yet natural setting. Playing together allows youngsters to be a part of the action versus being quiet observers. Play typically develops in a natural progression from individual play to parallel play (when children play next to each other) and finally to interactive/social reciprocal play. Many parents of children who are typically developing and those with special needs set up play dates to encourage the building of critical skills and friendships. The most important lesson learned from playing with a variety of children is that every person is different and special! Throughout life, we meet and interact with people of all shapes, sizes, and abilities. Learning from others can truly enhance our lives. 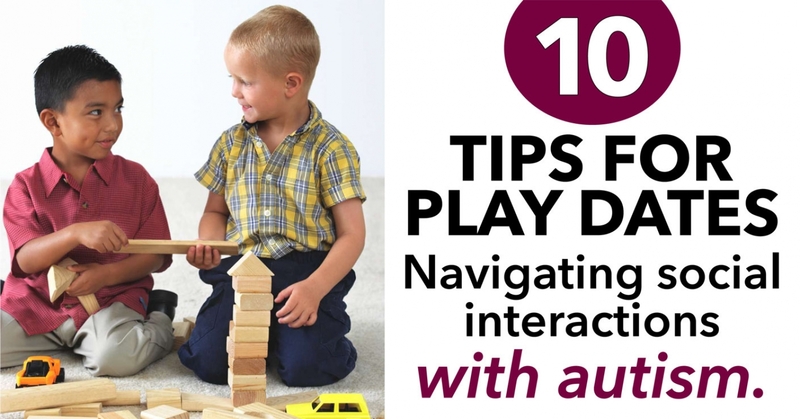 To make the most of the current Autism Awareness Month, here are some tried and true tips I recommend for setting up play dates with children who are on the autism spectrum. It may be hard to believe, but the act of playing doesn't come naturally to some kids. For example, children with autism often have difficulty with taking turns, having conversations, and interpreting nonverbal gestures. Practicing and explaining these concepts to your child may help him to feel more comfortable. For example, ask your child, "What is a facial expression?" Then, make different faces, and have your child guess your emotion. Together, discuss strategies that can be used to help facilitate play. 2. Find children with common interests. Teachers are amazingly insightful and may be able to identify the children who tend to play together well in school and enjoy similar interests. Volunteer in your child's classroom to see with whom your child is interested in playing. Additionally, birthday parties are great opportunities to observe potential play date matches. Clubs and activities allow children with similar interests to enjoy each other's company. My son showed an early interest in chess. I would often arrive early to pick him up from chess club and to determine who showed an interest in my son. The same is true for Lego club, music classes, art programs, or sports activities. Remember that parents of children with special needs are used to answering questions about their children and are often quite comfortable discussing ways to help create successful social interactions. Also, be mindful that many families' schedules are busy, but a child with special needs may have additional appointments for therapy, medical, and developmental concerns. Be flexible in scheduling, and do not be offended if the play date needs to be re-scheduled. 4. Shared interests can make a play date successful. Identify what the children have in common. Build activities upon mutual interests. So, set up Legos and build structures. If the children like the same movie, set up puzzle, art, baking, or sensory play activities based on the movie. Consider meeting at a location such as a park or museum. Siblings should not be a part of the play date to allow for targeted friendship building between the two participants. 5. Make a plan, and then review it with both children who are participating. Explain what the play date will look like: First, we will work on a puzzle, and then we will have a snack, etc. Many children who have special needs benefit from a visual schedule and knowing exactly what is coming up next. All of us enjoy predictability and feel more confident with a specific plan in place. However, be flexible if any difficulties or disagreements arise. 6. Consider food allergies and sensitivities. When planning a snack menu, contact the other child's parent to determine which foods are safe for both children. It can be very meaningful for the other parent and is a critical step to avoiding potential life-threatening reactions to foods. Do not be offended if the children do not eat what is set out for snack. The kids may just be too excited to eat! 7. Be mindful of any physical limitations. For example, many children with sensory issues do not prefer to get messy, dirty, or wet, but they can be super at doing other things such as building or creating. It's always a sensitive topic to talk about someone's weaknesses; instead ask, "What is Billy great at doing?" 8. Provide adult supervision and support throughout the play date. Since children of all abilities have different personalities, disagreements may arise. Consider ways to resolve conflicts such as asking both kids to take five deep breaths or closing their eyes and counting to 10. Make sure to ask the other parent which strategies are used when his child becomes stressed or upset. Preparation is a key ingredient in successful interaction when facilitating a play date. 9. Begin with short play dates of an hour. Keep the first play times shorter until the children become more comfortable with each other. It's important to end on a good note. So, if the children are in any type of conflict, help to facilitate a peaceful ending. 10. There is no such thing as a perfect play date! Do not put unnecessary pressure on yourself. Both typically developing kids and children with special needs are learning while practicing play and social skills. When learning a skill, we all make mistakes. Our children benefit from every social interaction opportunity. Give yourself a pat on the back, and enjoy watching new friendships bloom and develop. Cara Koscinski, MOT, OTR/L, is a pediatric occupational therapist, author, entrepreneur, and mother of two children with special needs. In addition to writing and conducting private consultations, Cara frequently shares her personal and professional knowledge, expertise, and experience as a pediatric OT and special needs parent with groups and organizations nationwide. Cara is the author of The Pocket Occupational Therapist for Families of Children with Special Needs (Jessica Kingsley Pub) and The Special Needs School Survival Guide: Handbook for Autism, Sensory Processing Disorder, ADH, Learning Disabilities, & More! (CreateSpace) For more information, please visit www.pocketot.com.